The Lead the Way Fund joins all patriotic Americans everywhere as we celebrate the awarding of the Congressional Medal of Honor to Army Ranger Sgt. 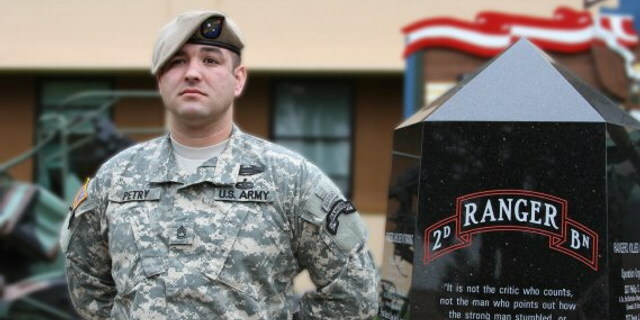 1st Class Leroy Arthur Petry. President Barack Obama will bestow the medal on Sgt. Petry at a White House ceremony on July 12, 2011. He is only the second living serviceman from the conflicts in Afghanistan and Iraq to receive the Medal of Honor. Sgt. Petry was nominated by fellow soldiers for his heroic actions in saving their lives and preventing serious injury while wounded and under enemy fire during a combat operation in Afghanistan on May 26, 2008. The Lead the Way organization first came into contact with Sgt. Petry after he returned from Afghanistan with serious injuries sustained on that day. Sgt. Petry lost his right hand and sustained shrapnel wounds when he threw a live enemy grenade back at the enemy during combat, saving the lives of Army Rangers. At the time the Sgt. Petry had already taken bullet wounds in both legs. He also applied a tourniquet to his own grievously wounded arm and continued to communicate with command while under fire. The Lead the Way Fund’s mission is to provide aid beyond that which the U.S. Government can give to wounded Army Rangers returning from combat. The fund also supports Rangers’ families in a variety of ways. Many Lead the Way supporters first met Sgt. Petry in September of 2009 at a fundraising event for Rangers hosted in Manhasset, NY. Sgt. Petry, in full uniform and by then walking and fitted with a high-tech mechanical hand, made a lasting impression on all attendees. Sgt. Petry met and spoke with many supporters at the event and even demonstrated his new hand’s capabilities. On that occasion in 2009 it was already widely known that Sgt. Petry’s fellow fighting men had nominated him for a Medal of Honor. Since then Sgt. Petry returned to Afghanistan for his ninth and last tour – this time in an administrative role. He had previously deployed twice to Iraq and six times to Afghanistan in service to the War on Terror. Today Sgt. Petry serves his fellow 75th Ranger Regiment soldiers as they return from combat. He works as a Special Operations Command Care Coalition liaison officer tracking and monitoring injured Rangers in the Northwest Region at Fort Lewis, near Tacoma, WA. Sgt. Petry lives there with his wife, Ashley, and their four children. Regan is the father of a fallen 75th Regiment Ranger, Sgt. James J. Regan, who died in fighting in Iraq in 2007. The Lead the Way Fund was created in Sgt. Regan’s honor. Sgt. Petry has gone on the record stating his appreciation for his fellow soldiers who recommended him for the Medal of Honor. In his humility, he wishes to share this unique honor with all those who fight and risk it all for their country. For more information on Sgt. Petry and the Medal of Honor, visit the Army Special Operations Command website: http://www.soc.mil/75th%20Ranger%20Regiment/Petry.html. The site also offers many photos and a storyboard that illustrates the combat operation on the day of Sgt. Petry’s heroism.